Writing a music drama about Alan Turing was a far more complex and dizzying undertaking than I had first imagined it would be. In a way, the story of Turing’s life is a composer’s gift: an eventful and ultimately tragic existence that had vast repercussions, the reverberations of which we are still feeling today. And yet it was a life shrouded in mystery. Turing left behind surprisingly few clues regarding what he felt about, well, anything at all. He was a private man dedicated to his passion for scientific and mathematical enquiry. But he was also a national hero whose genius saved millions of lives during the Second World War and who died as a result—at least in part—of persecution from the country he was instrumental in saving from oblivion. His is the clearest claim to the title ‘inventor of the computer’, thereby allowing me to type this on a train as it wheezes its way through the Surrey countryside (a landscape, incidentally, that Turing would have known well in his pastime as a distance runner of near-Olympic standing). There can have been few people in history who achieved so much of profound consequence for humanity in so little time. In Codebreaker I have focused on three key moments in Turing’s life, namely: falling in love with Morcom, the war, and his final hours. The piece begins with a prologue. 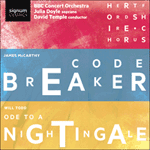 The very first words (‘We shall be happy’) come from the final line of the piece, making Codebreaker circular. There follow a couple of lines that Turing scrawled on a postcard that I think demonstrate that he had a poetic soul: ‘Hyperboloids of wondrous light / Rolling for aye through space and time’. The prologue concludes with Gordon Brown’s apology on behalf of the British Government from 2009 (predating the more recent Royal Pardon). Brown’s heartfelt apology gives a neat overview of Turing’s life and delineates the narrative arc of the piece to follow. At Bletchley, Turing was given responsibility for cracking the naval Enigma codes, famously the most difficult Enigma codes to decrypt at the time, and he did so by inventing a machine called the Bombe which greatly speeded up the process of decryption. It was one of the great intellectual feats of the 20th century. Every day brought a new code to crack which would unlock all of the German communications for the following 24 hours, so every morning there was feverish work to be done decrypting that day’s code, all the while everyone was aware that with every minute that passed thousands of sailors’ lives were at risk from U-boat attacks. At the time, war must have seemed unstoppable, the marching of jackboots irresistible. Yet at the same time Turing would have known this: that the natural world, the world of science, couldn’t care less about our wars, our conflicts. Nature will carry on as it always has long after we have all left this world in peace. In the 1930s, Turing had been captivated by Disney’s groundbreaking animation Snow White and he often repeated the following line: ‘Dip the apple in the brew, let the sleeping death seep through.’ In 1954, two years after his arrest and chemical castration, Turing dipped an apple in cyanide and took a bite. He was just 41 when he died. The final moments of Turing’s torment find their voice in Oscar Wilde’s De profundis (written to Lord Alfred Douglas while Wilde was imprisoned in Reading Gaol). Having bitten the apple, Turing slips into unconsciousness. Approaching death feels very much like falling asleep, or entering a forest from which he will never be able to escape. Later, reeling from her son’s death, Sara Turing sings Robert Burns’s A mother’s lament for the death of her son. Alan Turing was a quite brilliant mathematician. The father of computer science. At Bletchley Park his genius turned the tide of war. In 1952, he was convicted of 'gross indecency'. His sentence was chemical castration. Two years later he took his own life. On behalf of the British government I am very proud to say: we’re sorry. You deserved so much better. Christopher had a beautiful mind. They shared a passion for science and would map the universe together. Even as Love that laugheth after Life. The least word of your lips is melody! Sing me at eve but only with your sigh! Slowly and low, the sense that no songs say. Sing me at midnight with your murmurous heart! Throbbing through you, and sobbing, unsubdued. Over the world to you. Stilled by the stars at night. The same great roof of stars is dim. Blow by like music over me. Sara Turing: Christopher Morcom died very suddenly of tuberculosis. ‘I feel I shall meet him again somewhere and that there will be some work for us to do together as I believed there was for us to do here. Now that I am left to do it alone I must not let him down. Choir: Turing worked tirelessly on decrypting the naval Enigma codes. The Atlantic convoys, hunted by packs of U-boats, were in a perilous position. Whipped by the storm, screaming and calling. Why do I look for a place to rest? With fear an unhealing wound in my breast. Sara Turing: My son was arrested in 1952. For an affair with a young man. The magistrate offered a choice of sentence: Prison or chemical castration. Alan chose the latter. I am advised to try to forget it all. would all be tainted for me. is to arrest one’s own development. is to put a lie into the lips of one’s own life. Suffering is one very long moment. We cannot divide it by seasons. With us time itself does not progress. It seems to circle round one centre of pain. With him I love, at rest.